7. Lieb­herr WKb 4212 /ca­ves­hop/single-tem­peratu­re-cabi­nets/lieb­herr-wkb-4212..
8. Lieb­herr WKr 3211 /ca­ves­hop/single-tem­peratu­re-cabi­nets/lieb­herr-wkr-3211..
9. Lieb­herr WKr 4211 /ca­ves­hop/single-tem­peratu­re-cabi­nets/lieb­herr-wkr-4211..
10. Lieb­herr WKb 3212 /ca­ves­hop/single-tem­peratu­re-cabi­nets/lieb­herr-wkb-3212.. The web server used by Cavepromotor.co.uk is run by Combell Group Nv and is located in Group, Netherlands. On this web server 33 other websites are hosted. The language of those websites is mostly english. 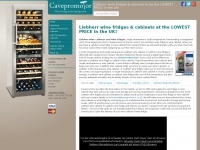 A Apache server hosts the websites of Cavepromotor.co.uk. For managing the data of the webpages the CMS Joomla! is used. The website uses the latest markup standard HTML 5. The website does not specify details about the inclusion of its content in search engines. For this reason the content will be included by search engines.